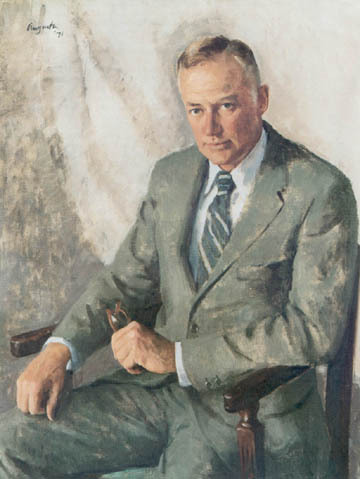 STANLEY ROGERS RESOR was born in New York City on 5 December 1917; attended the Groton School, Groton, Connecticut; graduated from Yale University, 1939; entered Yale Law School; married Jane Lawler Pillsbury, 1942; was commissioned a second lieutenant of Field Artillery from the Yale ROTC course, 1942; entered upon active duty and served with the 10th Armored Division in the United States, 1942�1944, and overseas, 1944�1945, in combat in the European Theater; received the Silver Star, the Bronze Star, and the Purple Heart; was separated from the service as a lieutenant colonel and returned to Yale Law School to complete his studies and receive his law degree, 1946; was admitted to the New York bar, 1946; entered into practice as an associate and then partner in the New York firm of Deveboise, Plimpton, Lyons, and Gates, 1946�1965, specializing in corporate law; served as Under Secretary of the Army, 5 April�1 July 1965; served as Secretary of the Army, 2 July 1965�30 June 1971; during his tenure major forces were committed to Vietnam at presidential direction, the Army�s first airmobile division was fielded, the American line of communications in Europe was shifted from France to Germany and the Benelux countries, Army forces were committed in support of civil authorities in serious civil disturbances, Vietnamization of the war in Southeast Asia was accelerated and withdrawal of Army forces instituted, and the Army initiated actions to achieve an all-volunteer force; returned to the practice of law in New York; was United States representative with the rank of ambassador to the Mutual and Balanced Force Reduction negotiations in Vienna, Austria, 1973�1978; was awarded the George C. Marshall Medal from the Association of the United States Army, 1974; was appointed Under Secretary of Defense for Policy, August 1978; resigned and returned to private life, March 1979; received the Sylvanius Thayer Award from the Association of West Point Graduates in 1984. George Augusta (1922� ) is a native Bostonian who studied art in Boston and in Italy and maintains a studio in Hampton Falls, New Hampshire. He has painted the portraits of a number of individuals prominent in business, the professions, and government, and is represented in the Army�s gallery with his portraits of Secretaries Vance, Resor, and Callaway.